Many collectors like the idea of participating in a group break but aren't quite sure if it's the right thing for them. If that applies to you, then now would be a good time to jump into a free group break hosted by STL Sports Cards in honor of their anniversary. As explained by Michael, owner of STL Sports Cards, the six year anniversary break is going down for you, the collector. 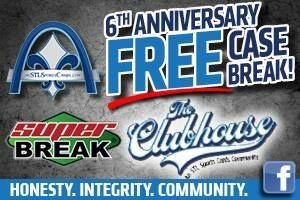 "Sponsoring with Super Break Sports, STL Sports Cards brings you a free group break to celebrate the amazing community you all have created over the past six years!" "The best way to do it is everyone is entered into a random. There are 5-8 items per case, so 5-8 people will walk away with a card and/or memorabilia item. For example: if 300 people join the giveaway, we would random the 300 names and, starting at the top, the first 5-8 names on the list would get an item from the break." Other information of note includes the actual date of the break, which Michael confirmed, saying, "Make plans to join STL Sports Cards on November 16th, beginning at 5 PM EST, as we celebrate with our official anniversary night! There will be loads of group breaks, free giveaways and more! This is the don't miss night of the year!" Built around the core pillars of honesty, integrity, and community, STL Sports Cards has created an atmosphere where young and old alike can come together and enjoy the hobby. If you want to see what they are all about, join their exclusive Facebook group: The Clubhouse. For more information on group breaks or how to participate in this free break, you may contact STL Sports Cards directly at STLSportsCards@gmail.com.